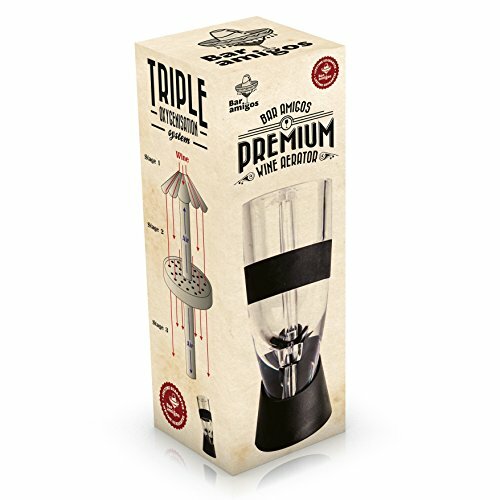 The 3 stage technology behind this aerator makes your wine taste as good as it ever will! Stage 1 - Pour your wine over the non-spill umbrella plate and watch it fan out to expose the wine to as much air as possible. Stage 2 - The wine is then filtered through the drizzle stopper plate which helps the process of softening tannins. Stage 3 - On the final funnel part stage you will see that as the wine goes through the stopper plate, air is also drawn through. In this area the wine bubbles and mixes with air, giving the final stage of oxygenation. 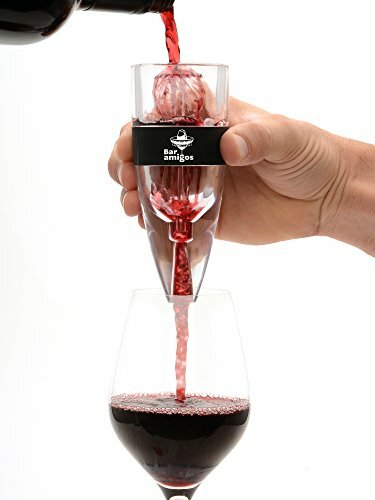 You will hear the process for yourself as the wine goes through the aerator sucking in air and giving it a real burst of oxygen. You won't only hear the magic of this gadget working, you will also see the technology of this amazing device oxygenate your wine. Seeing is believing. 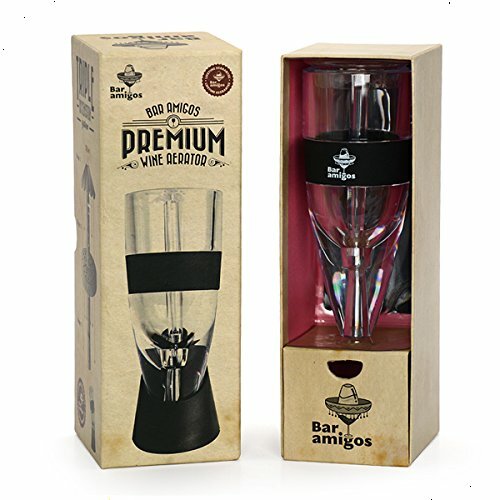 We know you will love our aerator so we offer everyone our no fuss Bar Amigos Lifetime Guarantee Does the Bar Amigos Wine Aerator improve the taste of you wine? The answer is YES! 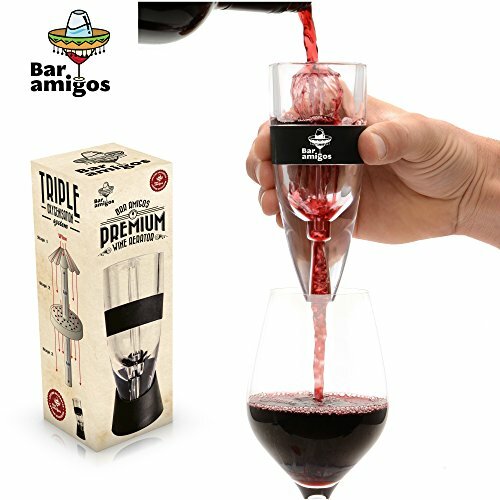 Perfect for wines that typically require more time to decant and if that's a virtue you don't have, then it's time to try the Bar Amigos Premium Wine Aerator. Experts that have tested this product found significant aeration that exceeds other methods. 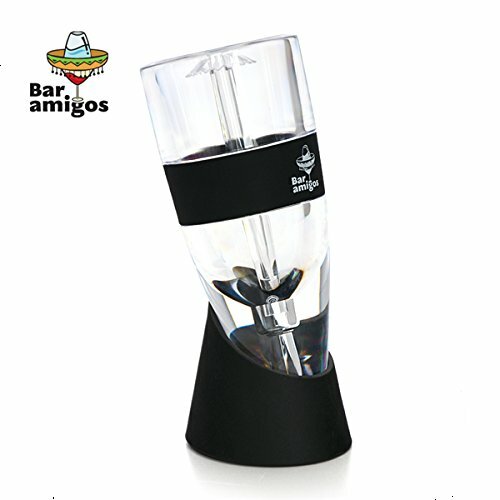 Using the Bar Amigos aerator results in improved aromatics and a more mineral character. Classed as a professional item, this is typically used by sommeliers, restaurants and wine connoisseurs at wine tasting events. Impress your guests at a dinner party. Not only a stylish table piece, but everyone will be amazed and want to give it a go! Makes a perfect gift for dad, mum, grandparents or a work colleague including the boss. Anyone that enjoys drinking wine will now enjoy it even more!!! 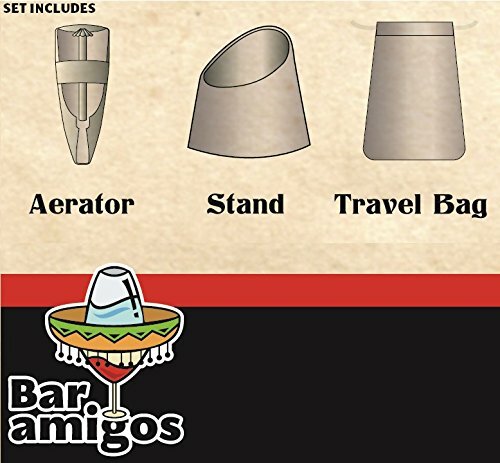 Bar Amigos è orgogliosa di presentare l'ultima innovazione di aerazione del vino. 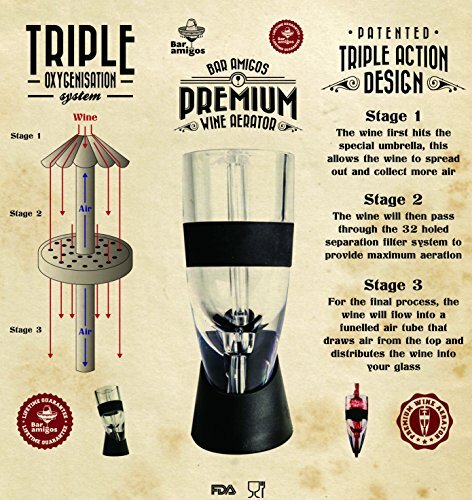 Il design a tripla azione brevettato fornisce un metodo rapido e semplice di permettere il vostro vino di respirare correttamente prima di bere. Niente più attese! 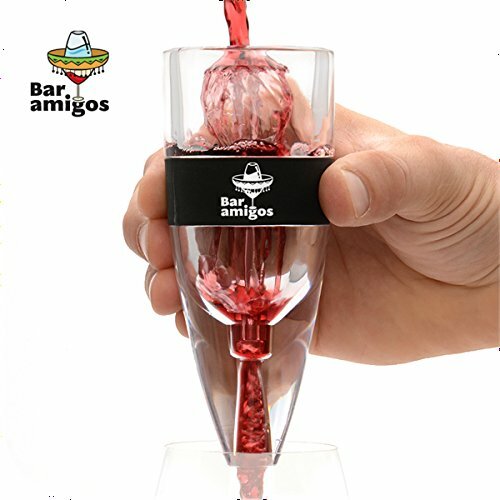 Bar Amigos® Premium Wine Aerator Aeratore Per Vino - Globalmente BREVETTATO Triple Action Design - Utilizzato da Amanti Del Buon Vino Esperti Sommelier e Ristoranti del Mondo- Set Include banco di mostra, Borsa Viaggi & Gift Box Esclusiva - Perfetto Idea regalo - Essenziali pranzare Accessori Per Rosso Vino Bianco potabile - VITA GARANZIA out of 5 based on ratings.